Costs can be classified by many characteristics such as nature or function, but one of the most important from the point of view of developing financial projections is the cost behavior classification. The term cost behavior refers to the manner in which a cost will change in relation to the volume of production or selling activity of the business. Variable costs are costs which will change in direct proportion to any production or selling activity. Examples which fall within the variable cost behavior definition are direct materials, direct labor and sales commissions. The total variable cost is calculated using the variable cost formula which multiplies the unit variable cost by the number of units of activity. The total variable cost changes as the level of activity changes. 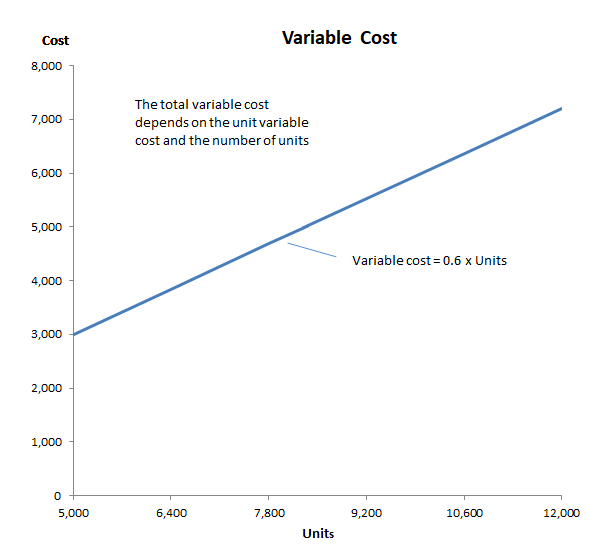 Assuming that the unit variable cost remains constant over the level of activity considered, then the variable cost behavior graph below shows how the total variable cost changes with the number of units. It should be noted that the unit variable cost does not need to remain constant and in most situations will change as the activity level changes. The variable costs definition for use in the financial projections template is costs which vary with the level of output of the business. Variable costs are usually included as part of the cost of sales figure in the income and expenditure statement as this allows a realistic gross margin and break even sales point to be calculated. Fixed costs are costs which are incurred whether or not a business has any production or sales activity. Fixed costs are a function of the passage of time and are sometimes referred to as periodic costs for this reason. Examples of costs which fall within the fixed costs definition are rent, insurance and general and administration salaries. 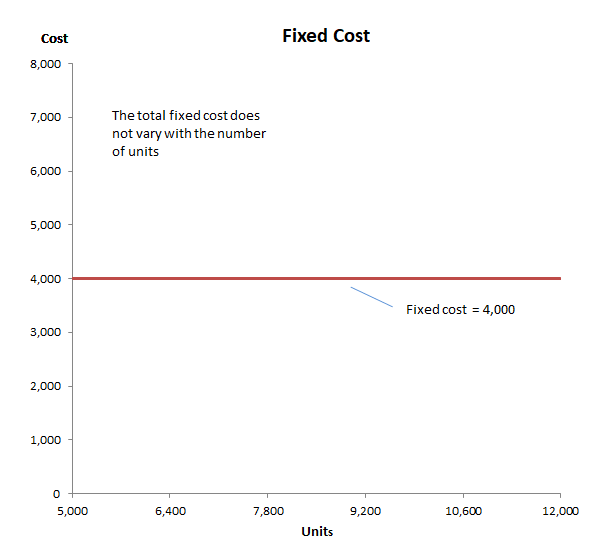 The fixed cost behavior graph below shows a business with total fixed costs of 4,000. The total fixed cost remains constant over the level of activity considered. It should be noted that fixed costs are only fixed over a range of activity and tend to take steps up or down between activity level ranges. For example, if a business rents a new manufacturing unit then the level of output will increase and the range of activity and the fixed cost will change to a new level and follow a step cost behavior. The fixed cost per unit can be calculated using the fixed cost formula which divides the total fixed cost by the number of units. The fixed costs definition for use in the financial projections template is costs that do not vary with the level of output from the business. Fixed costs are normally included as part of operating expenses in the income and expenditure statement. In reality most costs have a variable and a fixed element. For example, employees cannot be hired and fired to suit production levels, and so labor costs have a fixed component independent of production or sales levels. Costs which have a variable and fixed component are referred to as mixed costs or semi-variable costs. When preparing financial projections mixed costs need to be separated into their variable and fixed cost components in order that they can be correctly forecast as the activity level of the business changes. 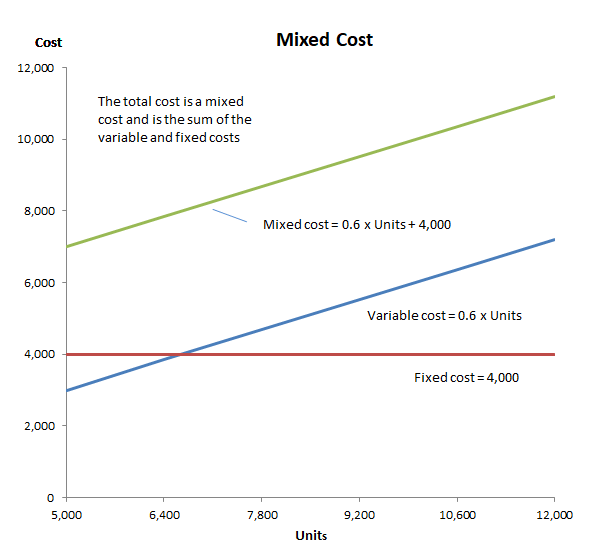 Assuming the unit variable cost and the total fixed cost remain constant over the range of activity being considered then the mixed cost formula or semi variable cost formula can be used to calculate the total mixed cost. The cost behavior graphs below shows how the total mixed cost changes with the number of units. When preparing financial projections, if historical information is available on costs, then a technique called the high-low method can be used to calculate the unit variable cost and the total fixed cost components of a mixed cost. Suppose for example historical information shows that when used for 5,000 miles the cost of operating the vehicle is 7,000, and at 12,000 miles the cost increases to 11,200. The table above shows that for a 7,000 change in the mileage (units) the total cost changes by 4,200. Based on this information the unit variable cost component can be calculated using the high low method cost formula as follows. The unit variable cost is now used for either the high or low values in the mixed cost formula to calculate the fixed cost component. This mixed cost formula can now be used in the financial projections to establish the total cost at any level of activity within the range being considered. The cost behavior including the variable and fixed cost components determine the cost structure of a business and can have a significant impact on whether a startup business is successful or not.